Hello dear bloggers. This is a tale of a Sea Witch tail, who after dealing with severe arthritis in my left knee for almost 5 years now, is finally going to have knee replacement surgery. It has taken its toll on my quality of life these last 6 months so I am excited to have this done. I am blessed with a fantastic surgeon who, on this Friday, will take his skill and replace my diseased knee with a replacement. There will be a lot of physical therapy involved so I will be taking a short break from the blog as I work the PT and get my new tail in swimming and walking order. So this will be my last post for about 6 weeks. In prep for not "antiquing/junkin" over the next 6 weeks, I hit a few of my favorite haunts and came back with some nifty treasure. Two favorite finds and I may keep both are antique, french books from the 1800s. The one to the right is beautifully bound with handwritten script on the inside cover. It is the story of St. Francis and holds beautiful engraved prints. It is marked first edition and dated 1847. Just love this antique wrought iron trestle with arrow at the top. Several shades of shabby green paint make this a winner all around. How about Peter Rabbit in his great little coat. Nice concrete statue. Everyone needs a little Romeo in their life and this vintage, bisque china doll kit from Yield House is way to fun. Vintage Chintz plate and planter. Circa 1940s Japan. I really like the graceful lines of this pretty hand figurine. Soft matt glaze. Check out the sweet face on this carnival chalkware prize from the 1940s-50s. Collie dog with glitter around face. Measures about 8 inches high and in really great condition. Exquisite bone china serving bowl with pretty pink ribbons running through it. The ribbons are such a lovely touch. The brass Victorian page holder is a reproduction but these are such cool items that I grab them when I can find them. A pair of antique Seltzer bottles and a post Prohibition "Golden Wedding" Rye bottle that is a pale marigold carnival glass color. Marigold carnival keeps popping up around me. Crazy about the carnival Ginger Ale bottle from the 1930s and this lovely pair of Ivy and grapes carnival glass in a rich, orange marigold luster. Pretty shaving mug with teal bottom and transferware posies. Huge, white Johnson Bros. stoneware water pitcher from a bath set. Really lovely, but does have a large chip and crack on the other side. Still, these are perfect for holding your favorite flowers. "Our Little Lady” Chromolithograph print. 1888. Cosack & Co. Buffalo, N.Y. A past owner reframed with a contemporary matt and antique frame. She is a sweet little print with colors that are brilliant and true. I actually found a pair of these beautiful hand colored etchings. This framed piece is of Dreimarksteingasse, the summer cottage of Johann Strauss. Strauss and his family lived here during the summers of 1829 through 1836 and it is here, Johann supposedly completed his first waltz when he was six. Signed in pencil by the artist. Circa late 1800s-early 1900s. I am still doing a little research on the other etching. It is by the same artist but I'm having difficulty reading the description as it is in a foreign language. I've packed my main booth with lots of stuff as I won't be getting back to it for about 4 weeks. 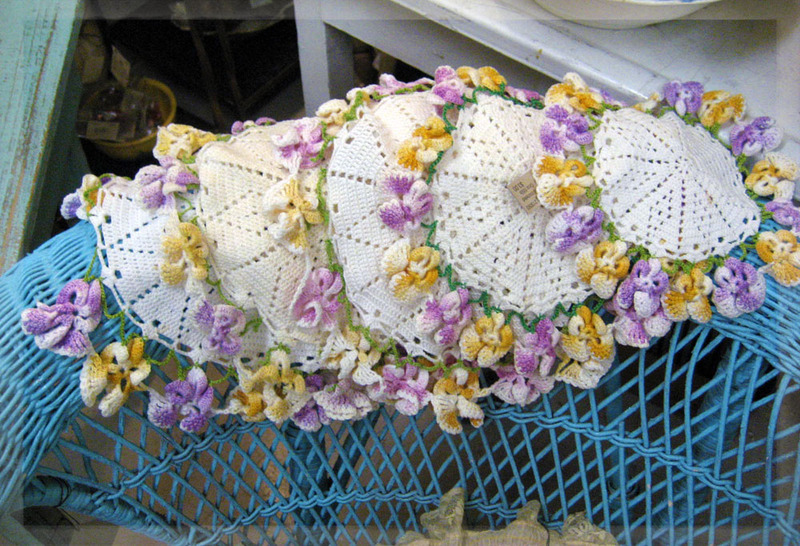 Lots of shabby whites, sea witch aquas and touches of soft, spring colors. I hope my two booths aren't too much of a wreck when I get back to them post surgery and physical therapy. It's gonna be hard to keep me away from the booths during the healing time. LOL. It was a marvelous Saturday for finding treasure. One of my best weekends ever. Interesting pieces and some great Victorian finds. It's always interesting to see what turns up at favorite hunting spots. I come across Hummel figurines every now and then, but have never found such a large piece. There is a home repair on the halo and a broken finger on the Baby Jesus, but for a few dollars, I had to take it home. A great selection of Easter postcards from the early 1900s, many are unused and the colors are marvelous. This is the second pair of Victorian high tops that I have come across locally, Don't know if someone is cleaning out their great grandmother's closet but I'm delighted with the find. Black leather shoe with canvas hightops in great condition and very wearable. Very 1890s. Love these mounted scarab beetles for their brilliant emerald iridescence. How cha cha is this great, barkcloth purse from the 1940-50s? From the same yardsale, a pretty satin stocking bag with handpainted roses on the outside and the inside. 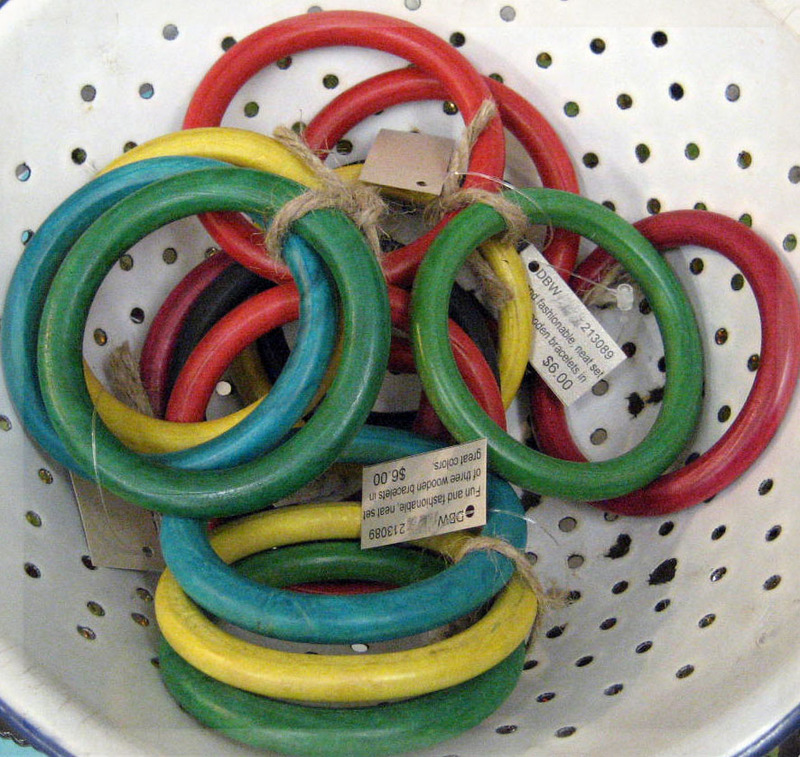 A pair of large, metal wire candle holders. 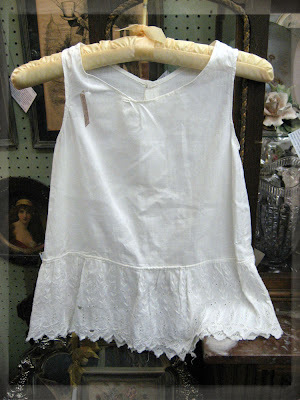 Perfect for the warm spring and summer evenings that will be heading our way. Sweet little tiffany type stained glass lamp. I love this metal welcome sign with the polka dots on it. I found three of them and they are a great decorative element. How snappy is this neat boy's wool shorts and shirt with tie? Nice deadstock for the child's vintage clothing collector. Warm hugs to all our friends and family in the northeast as they dig out from the blizzard conditions. We don't get the snow here but we have gotten crazy weather from freezing temps and in less than 12 hours it's 68 degrees out with the sun shining. Saturday was overcast and cool so it seemed like the perfect weather to head out to Monroe for a visit to antique row. Before I get to Monroe, I pass through the very small community called "Between". The town is called Between because it is between two of Georgia's largest cities — Atlanta and Athens and both are exactly the same distance to Between. It is also between Walton County's two largest cities, Loganville and Monroe and covers just less than one square mile. I have driven through Between for three years now and never noticed Hidden Treasures Country Store. No excuse for me not seeing it as Hidden Treasures Country Store is right on the highway. I think that Between is so tiny that you are through it before you know it. Still, I was glad to see the neon Open sign as that is what alerted me to this quaint little shop. 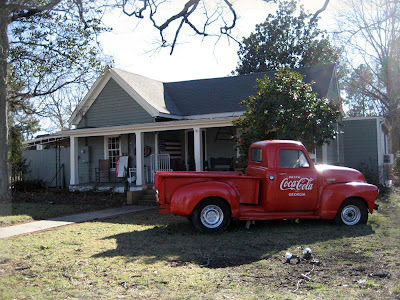 Of course, the bright red Coca Cola delivery truck is a great advertisement their location as well. 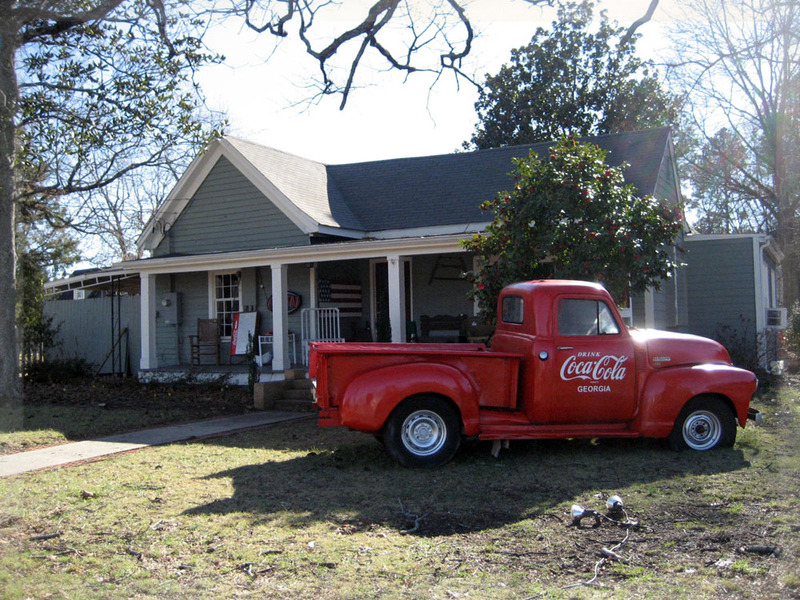 Of course, this being the south, seeing a fancy red vintage truck in the front yard is not unusual. A take a quick drive around the back to their parking and I am greeted with lots of great yard art. Bottle trees abound and the sunlight makes them sparkle like jewels. 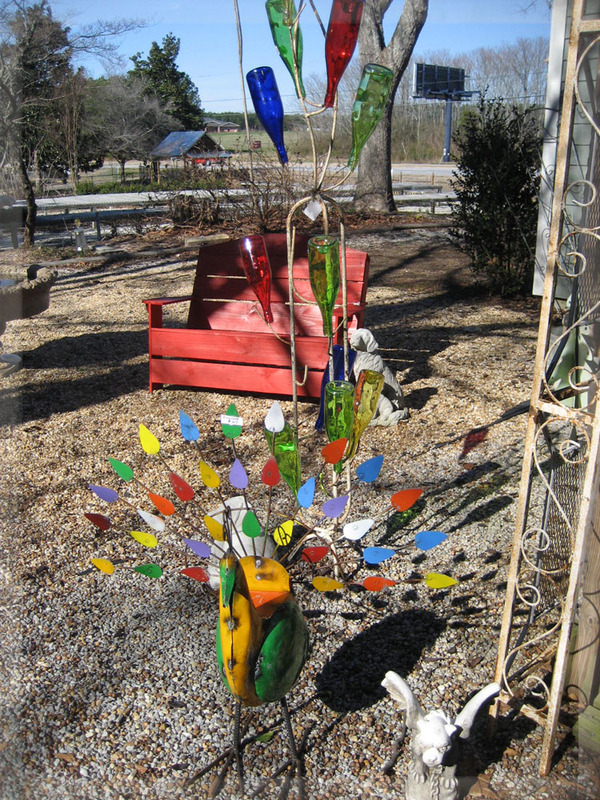 The friendly peacock is brilliant with color. 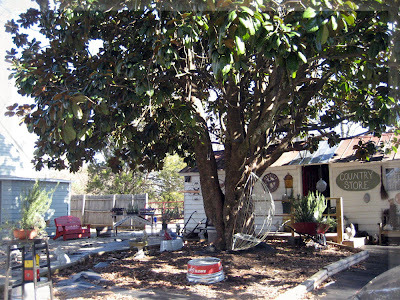 Adjacent to the Hidden Treasures antique and decor shop is the Country Store. 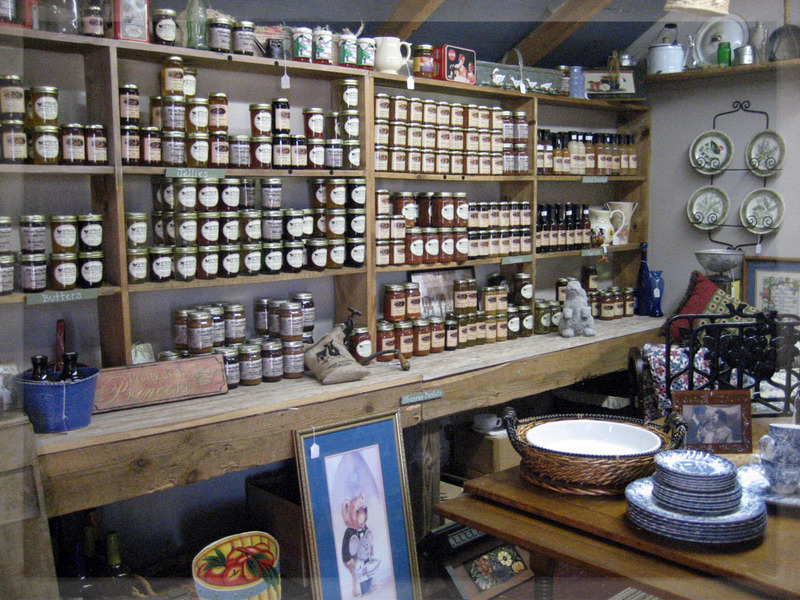 Shelves full of homemade jams, jellies, butters, ciders, you name it...it's there and it all looked tasty. 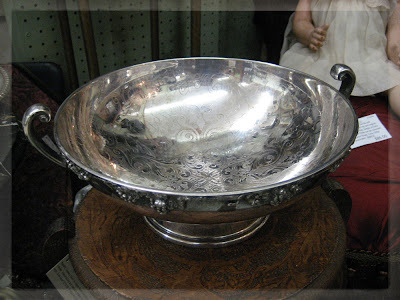 Now, on to the antique and decor shop. I'm greeted by two delightful ladies who welcome me and offer hot, brewed tea and chocolate. Yes, this is what heaven must be like. The shop is a great little home with original pine flooring and pretty molding...I am told that the original half of the home was a former slave house. I adore this type of local history. Rooms are full of vintage items. 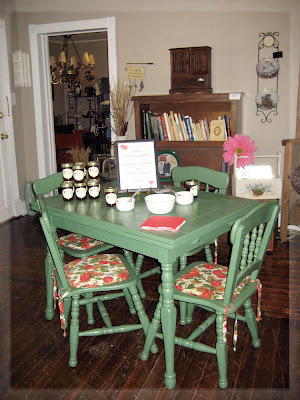 Sweet little kitchen table and chairs with vintage pads. 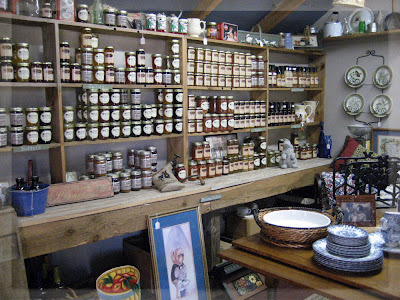 Bowls of crackers and open jams and jellies from the Country Store are offered to all visitors. 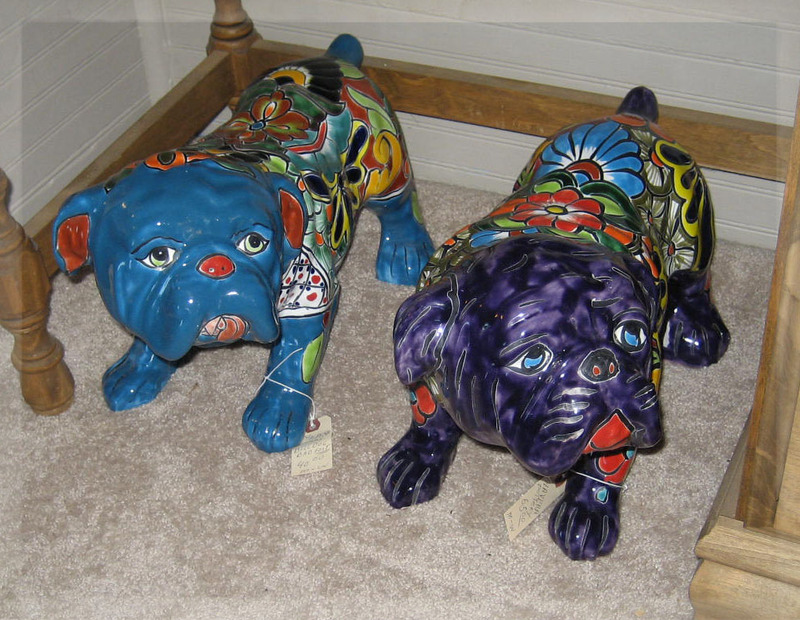 Look at these adorable bulldogs. If you are a UGA fan, you must have one of these cuties. 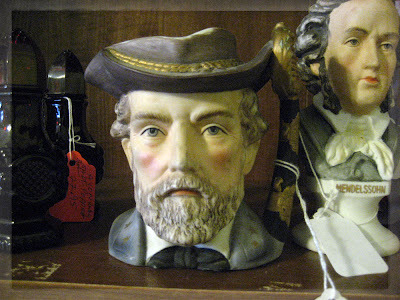 Haven't seen one of these Lefton, General Lee toby mugs in decades. Now this is a hidden treasure. 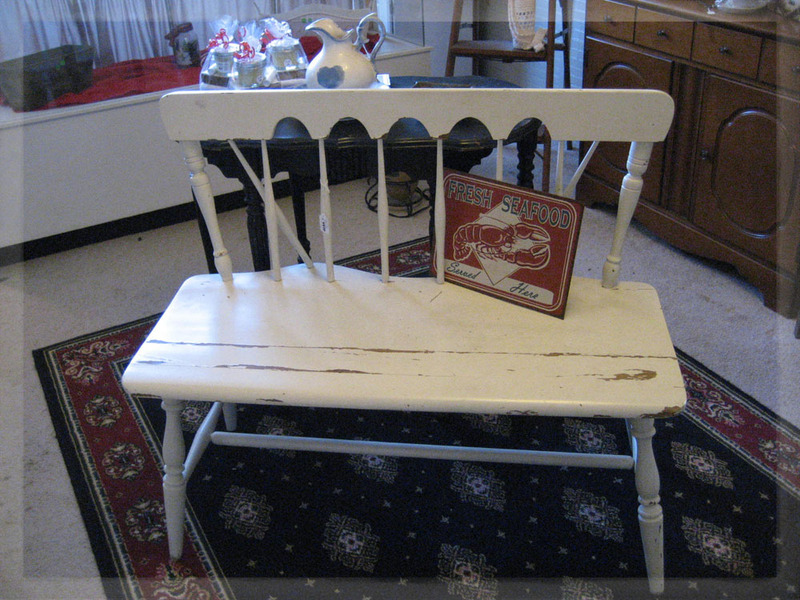 Terrific little wooden settee is very cottage chic. I adore homemade soaps but often they are so expensive for a small chunk of soap. Not at Hidden Treasures. 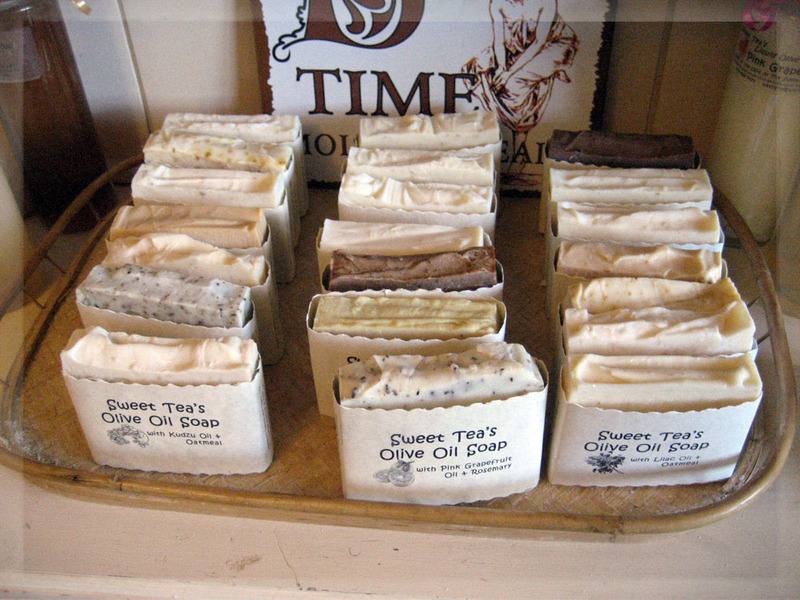 A local soapmaker produces nice size bricks of homemade olive oil based soaps for $5.00 each or two for $8.00. I purchased four of them with oatmeal and lavendar, citrus and oatmeal, kudzo and fennel and a pure olive oil bar. They smell heavenly and have a terrific consistency and leave your skin full of moisture. 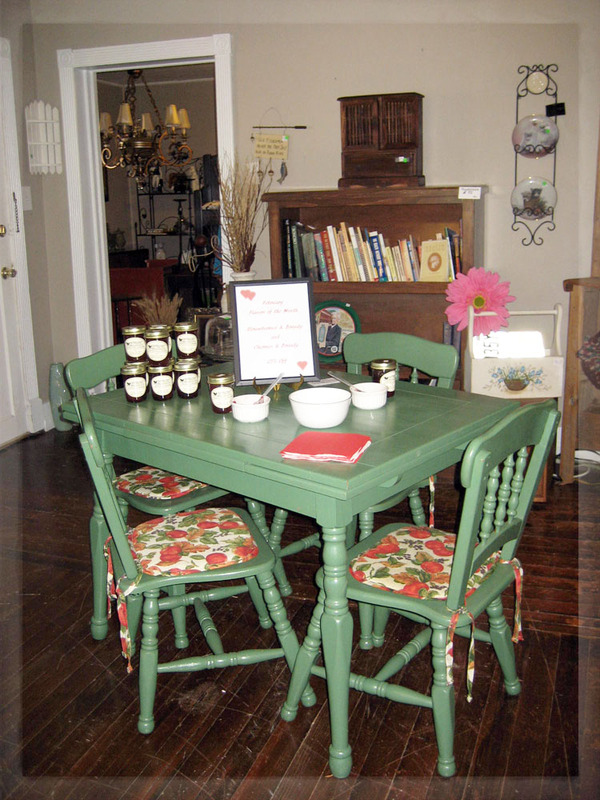 I will return to Hidden Treasures on my next visit to Monroe, especially since they will have flea market tables starting in April. Once in Monroe I went on my treasure hunt. I always stop in Hodge Podge and Davis Street Antiques. Two great antique malls filled with antiques, garden chic, romantic farmhouse and vintage decor. 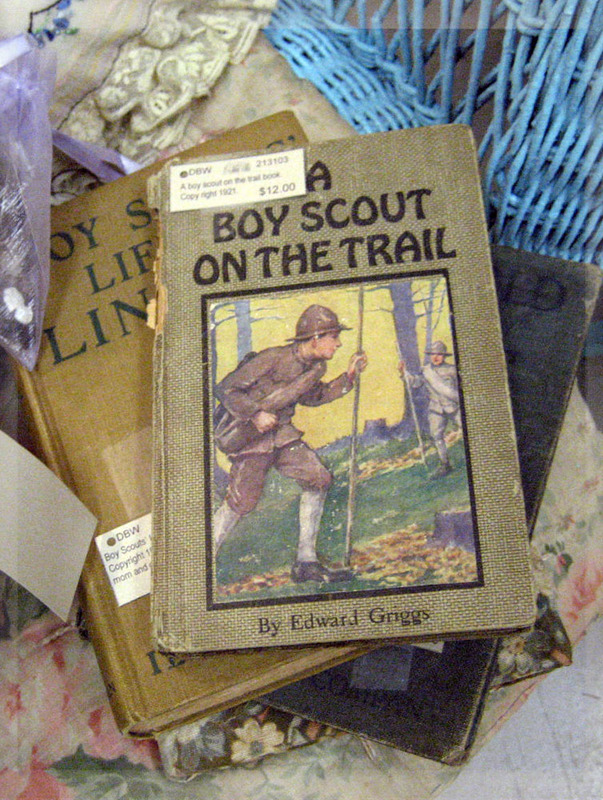 Found a pair of books with a Boy Scout theme. Both from the 1920s. Lovely inscription in the "Boy Scout's Life of Lincoln" book from Mom and Dad to their son at Christmas 1925. 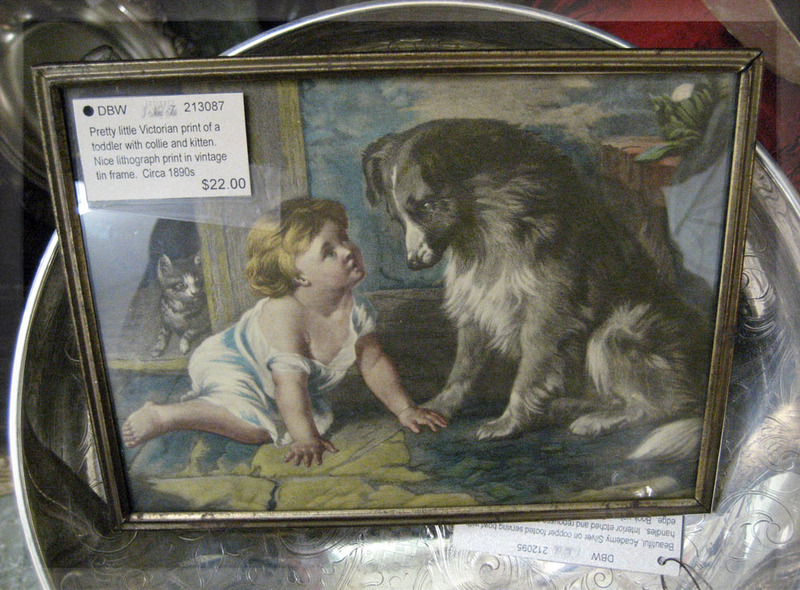 Look at the sweet faces on this lovely, turn of the century print of a toddler and pets. 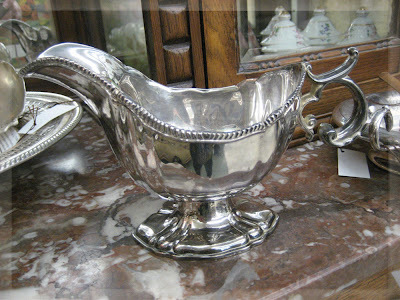 Hand wrought Capidomonte always catches my attention. 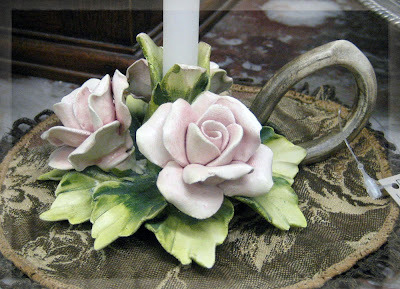 I love the realistic look of the roses and leaves and the soft, watercolor wash of the glazes. Yes, there is minor damage along some of the leaves edges but I don't care. These are always so lovely and this one has its original label on the bottom. 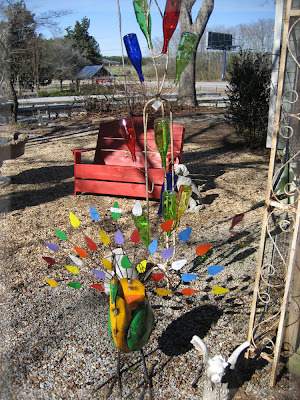 This was the oddest weekend for finding Marigold carnival glass. It was everywhere, but sadly, most was chipped or highly damaged. Still, I managed to find a few pieces that I could clean up and resell. 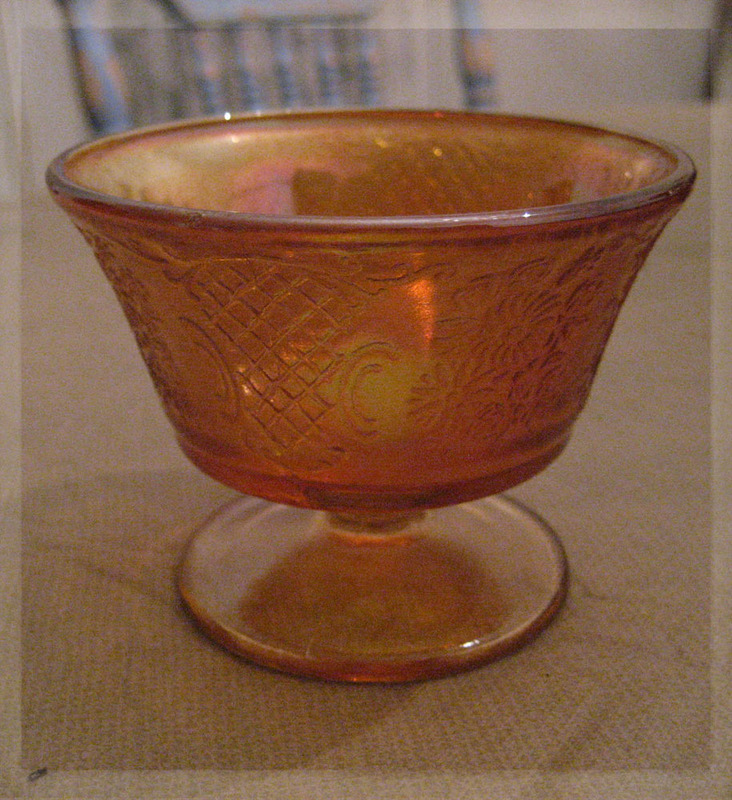 This pretty Depression glass custard looks like it sat in a china hutch for decades. At $1.00 I had to take it. It will light up a room with a small, votive candle in it. How about four, matching dinner plates to that pretty little custard cup above? 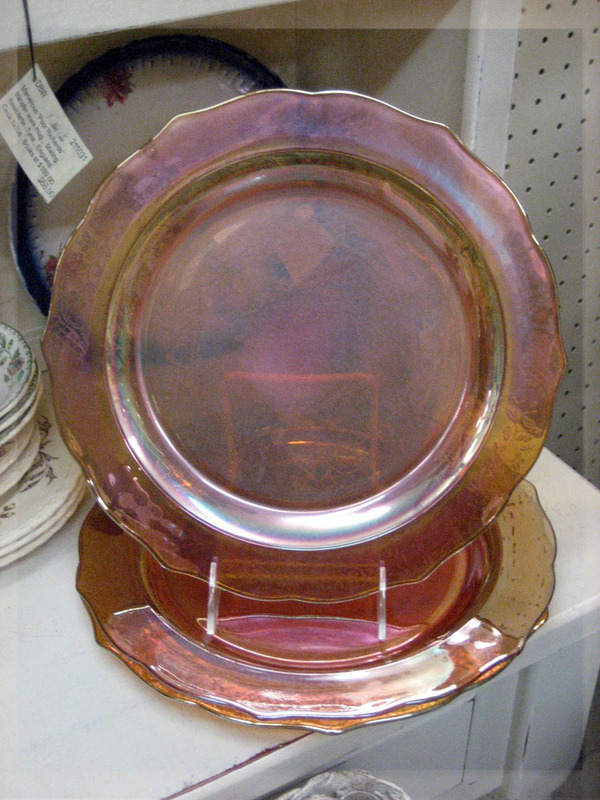 These plates are pure, iridescent fire. 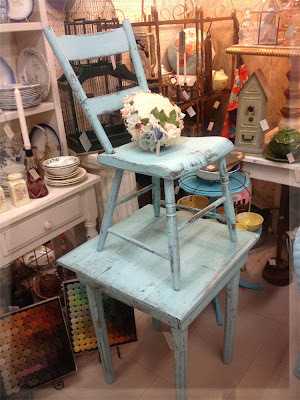 Okay, these are not vintage or antique but I just love that they are wood and stained with summer colors. You can't have a bad day with a set of fun bracelets. Now this is the original "blue plate" once found in diners and small town luncheonettes across America that offered the "Blue Plate special" to its diners. 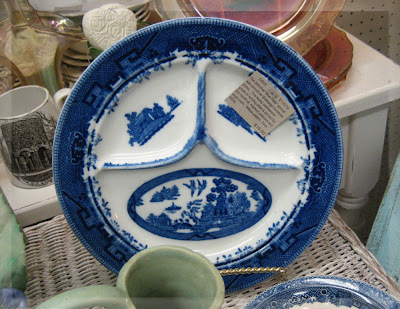 Heavy Shenango Pottery, divided plate in a rich flow blue, Willow Pattern". Can't you just see the homemade meatloaf, mashed potatoes and green vegies served to a hungry truck driver? 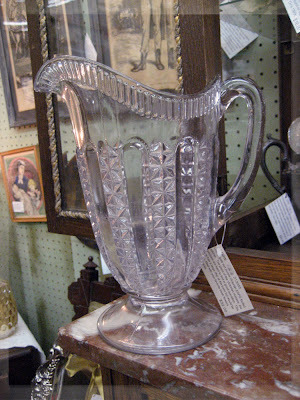 Lovely, tri-pressed EAPG footed pitcher. This heavy pitcher has the early signs of sun purple and even though it has a big chip on the base foot, they are precious to me as these easily date 110-150 years old. Amazing that this pressed glass lasted so long. As an avid needlewoman, I gravitate to the fiber arts on all levels. To find the 5 graduated doily set of pansies was a neat find. Perfect for rushing spring into your living space or if you are like me, I think pansies are such happy flowers that you have to just have them. As I was coming home, I stopped in to My Sisters Antiques in Loganville and although I missed seeing the sisters, I did find a few items that had to come home with me. 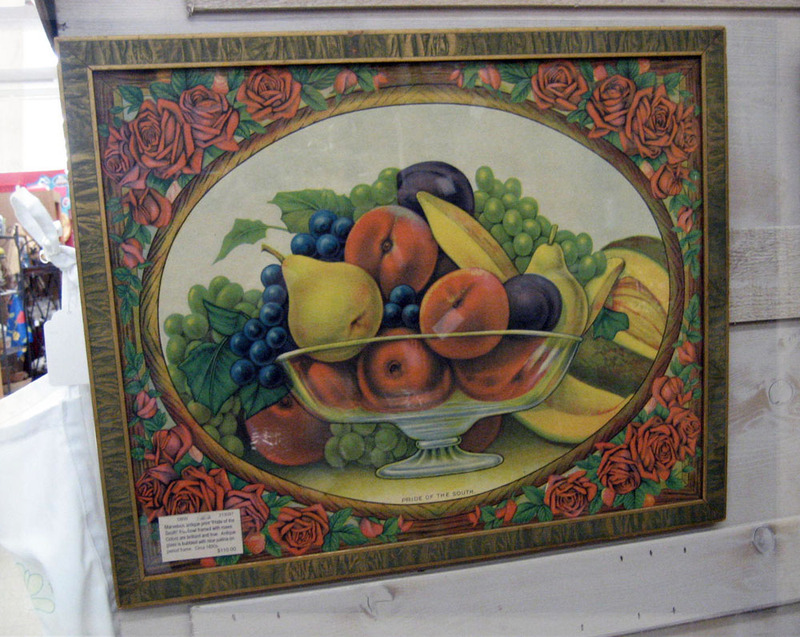 This beautiful chromolithograph in original frame with bubble glass would look lovely in kitchen or dining space. It's titled, Pride of the South, and looks like a huge crate label. Love the pretty red roses around the oval still life of the glass bowl with fruit. This was a find at a yard sale on the way up. Almost didn't stop as it was full of baby items, but I saw a table full of things that looked interesting. This heavy silverplated and etched over copper serving bowl was among those interesting things. Nice, heavy piece has so many decorative uses. 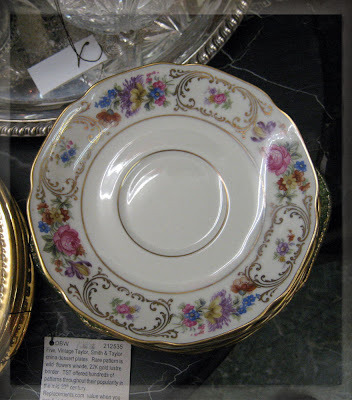 I sell pretty vintage china setting as quickly as I can find them. Five Bavarian china saucers marked US Zone, tells us that these were produced in the US Zone of occupied Germany during WW2. I love to use saucers to serve cupcakes as they seem to nest in the cup pocket so nicely. Sweet little child's cotton slip from the 1930s. Haven't come across one of these Junior Fire Chief badges in decades. Hard to find the molded metal ones anymore and this one still has its pin back. 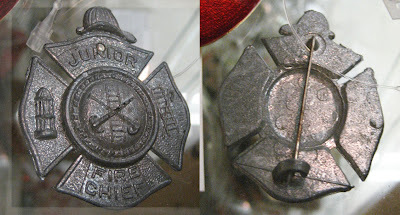 Circa 1930-50s and handed out to children during visits to their local firehouses. One of the jewels I found at Hodge Podge in Monroe. 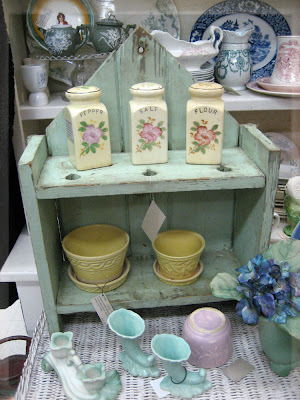 Love Love LOVE this pale seafoam green shelf. There are two sets of holes on the top shelf, both like figure 8, with small holes above the large holes (small holes are covered by shakers). Nobody seemed to know what the holes were for and I'm taking any ideas to solve the mystery. It's probably very obvious once something recognizes the shelf's use. 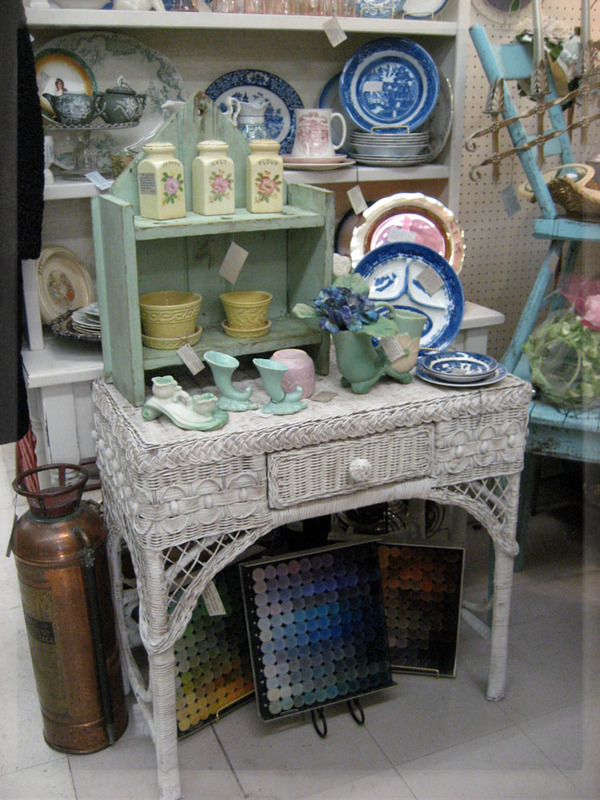 How about this pretty little vintage vanity desk? Another Hodge Podge find. So it was a very, very fruitful roadtrip on Saturday. I actually found a few additional items but forgot to photograph them after I brought them in. I'm such a blonde at times. And, finally. 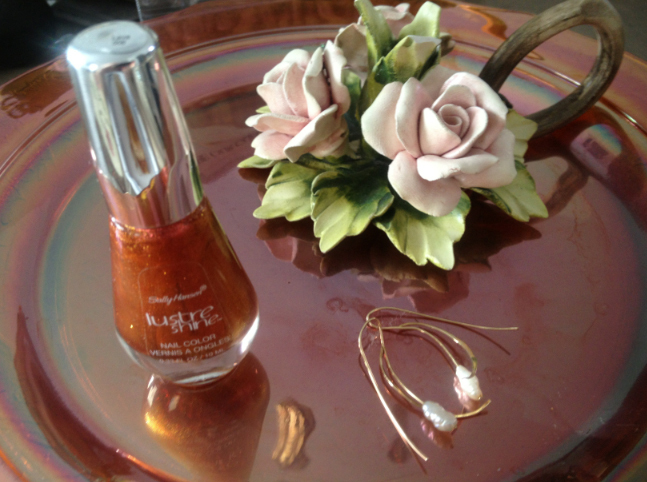 I saw so much marigold carnival glass this weekend that when I saw this nail polish at my local Walgreens, I had to get it for my SeaWitchy toes. They have the identical iridescence that the carnival glass plates have. Life is good when you can paint your toes the same color as a set of vintage Carnival glass plates. LOL Have a marvelous week and blessings to you and those you love.